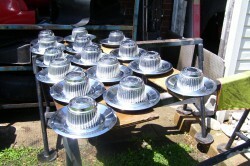 Description: Rally Wheel Centre Caps. All 15 for $150. Firm. Set of 4 for $60. Firm. They are real good.